Today is a big day for New England's Hidden Histories and the Congregational Library & Archives! 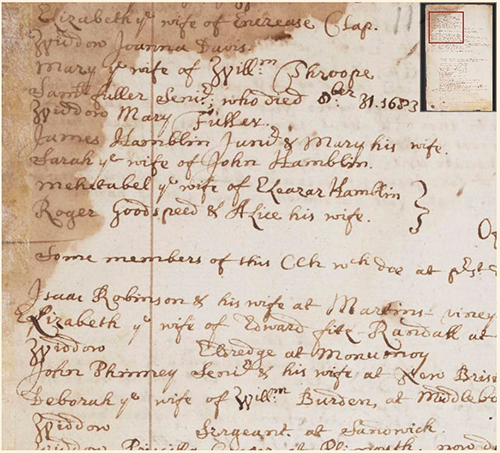 We are pleased to announce the addition of two new collections to our New England's Hidden Histories program — the early records from West Parish Church in Barnstable, and a volume of advice from an anonymous man facing his own mortality. Together these collections add over 500 new pages to NEHH. We are very pleased to be able to provide these collections and would like to give special thanks to the National Endowment for the Humanities, whose Humanities Collections and Reference Resources grant helped with the processing and digitization. 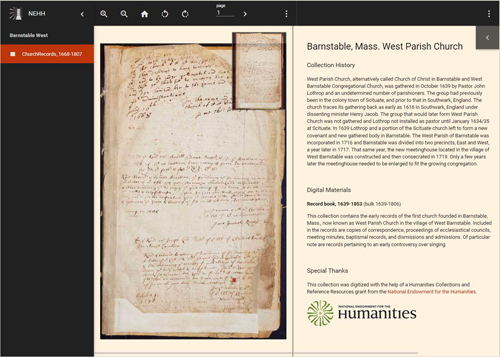 We are also excited today to launch our updated document viewer. The viewer now comes with new features and a sleek new design. You can rotate images by 90-degree increments and zoom in while retaining the crispness of the image. As we begin adding transcriptions to collections, more features will become available. Keep an eye on this blog for a user's guide for the new viewer (coming soon) and for more collections digitized with the help of the NEH. These digital resources have been made possible in part by the National Endowment for the Humanities: Exploring the human endeavor. Any views, findings, conclusions, or recommendations expressed in these resources do not necessarily represent those of the National Endowment for the Humanities. Beautiful and heartening to be in touch with people from our earliest years. Love to look at the handwriting and language. Super and congratulations to all.